This week's blog, as a bit of a treat, is written by Marcia herself but the photos are, as always, mine. Rodney. I discovered what I know of Dartmoor through journeys. The first journeys began when I was very small; my father was a director of Staverton Contractors, near Totnes, and we made the monthly journey with him, travelling by car from our Somerset village into Devon, watching for the first glimpse of the great hills away to the west. Even now, nearly sixty years on, the sight of the moor from the top of Haldon Hill fills me with delight and with the sense of homecoming. Whilst my father attended his meeting we – my mother and sisters – spent the day in Totnes or perhaps in Paignton. Actual visits to the moor were few and far between. These were confined to summer holidays on those days when the weather was too wet for us to venture out on to the beach and, instead, we piled into the car and my father drove us inland across Dartmoor. I think that it was because we’d spend the whole day journeying around the moor – given that I was very young – I gained the impression that Dartmoor was another country. It seemed immense, vast – and what was crucial to me – empty. I loved, still love, the bleakness. The fact that we often saw it in bad weather only added to its magnificence though sometimes we were lucky and the sun shone and it was hot. Sixty years ago it was very easy to be alone on the moor, apart from the ponies and the sheep, and I loved that. It added to its sense of mystery. Another tremendous treat about these journeys was that we picnicked. My mother hated impromptu messy meals but not as much as my father hated the idea that he might go hungry. He had withdrawal symptoms if he were to be too far away from some kind of hostelry and so, on Dartmoor days, the hotel made us up a large hamper. Neither of my parents walked much but as the car drifted slowly through the landscape my imagination was fully engaged in the games that were begging to be played out there, and I pleaded to be allowed out of the car. Only when we picnicked, however, could I roam free. Dartmoor haunted my imagination. There was a small but important milestone on the journey. When I was about ten my class at school was invited to enter a national competition. We each had to write an essay on any subject we chose but it had to include three words: Brooke Bond Tea. Easy. I wrote about a prisoner escaping from the prison. I’m sure that it owed a great deal to Mr Conan Doyle, and there were plenty of atmospherics, but my prisoner, worn out and exhausted, stumbled upon a remote cottage and was invited in by the elderly occupant. This compassionate and incurious woman, not knowing or caring who he was, offered him sustenance – but the bloodhounds and the prison warders were close on his heels. His last words as they dragged him away were ‘At least I had a cup of Brook Bond tea.’ It says much for the standard and quality of the other essays that I actually won the prize. Even so, I had no other inclinations to write about the moor. It was the most wonderfully magical place in the world, and I felt that it was my place, but it wasn’t until I was a young married naval wife with a two year old son, Charles, that I realised my dream and actually lived on Dartmoor. 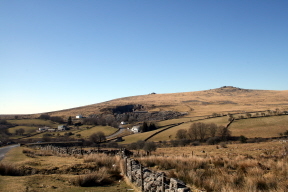 Moving to Dousland, to live at last on Dartmoor, really did feel like a homecoming. I could climb over the fence at the bottom of the garden straight out onto the moor. Every direction in which I drove took me across it. Tavistock was my local town and, when Charles was five, he went to Meavy School. My dream had come true. I’d walk to meet him after school and we’d have picnics at the ford with our golden retriever, Cassie. Charles did all the things I’d longed to do as a child and it was absolute heaven. When he was at school I’d drive around the moor guided by instinct rather than by maps, then park the car and walk. I often had no idea exactly where I was but I didn’t much care; I just wanted to be out there, alone, apart from my dog. It was much later that I began to realize that I preferred to be out on the moor early and late. I avoided, if I could, the middle of the day. In the middle of the day, especially in the summer, the magic disappears. The landscape, no less magnificent, is flattened. There are no shadows, no mysteries, no mist drifting in the valleys; it was more difficult then to enter into my own private world of the imagination and so I avoided it when I could. In the same way I dislike high summer. The foliage heavy and fading and dusty, the hard bright sky. No mystery. It never occurred to me that one day I should write about it and that the mystery would be essential to me to be able to do so. My whole approach to Dartmoor is an emotional and spiritual one: I need to feel that sense of healing and comfort and joy that comes from an infinite and unknowable presence. There were more journeys. I moved away, reluctantly, and Charles went as a boarder to Mount House School. Then there were the journeys from the naval base in Chatham when I’d drive from Kent, through Exeter and Moretonhampstead – no M5 in those days – and across the moor to meet him for exeat weekends and we’d stay at the Bedford Hotel. Later we moved to Avonwick and I’d alternate the journey to school; sometimes through Cornwood and sometimes through Ashburton but always across the moor. Many people know how my husband persuaded to me to write and for how long I resisted him. When at last, however, I reluctantly began to consider how on earth one wrote a book, and what it might be about, I had no problem with location. My characters brought the landscape with them and the landscape was Dartmoor. My journey now was a different one. The characters were no problem to me; they revealed themselves to me gradually but very completely, connections and relationships were made clear – but the landscape was a different matter. For nearly fifty years I’d revelled in it but describing it was something else again. How on earth can one do justice to it; how evoke it? And just as all my life I’d instinctively avoided the heat of the day and the height of summer, so now I knew that I must avoid too much description. I simply wanted to evoke so that readers could use their own imaginations and conjure up their own mysteries. Descriptive writing is agony to me, especially trying to bring something fresh to scenes and seasons I’ve described through twenty odd books. I spend hours writing three sentences, attempting to distil the essence of the mystery and the magic into words, but still, as I search for a phrase that might pin it down, Dartmoor continues to elude me, keeping me on my toes. Nothing thrills me more than an e-mail or letter from a reader who has been touched by such a description. I have a reader in Tasmania who writes to me saying that the books make her homesick for the moor that she hasn’t seen since she was a child. Back then she could see it from her window, as I can now as I write, and sometimes it seemed so close that she might touch it and other times it was far away, mysterious, remote. She sends me e-mails saying from time to time saying; ‘Are the moors close today?’ and I know she’s feeling homesick. Each time a new character appears, bringing the familiar landscape, I go out to find exactly which part of the moor it is and so the story reveals itself. The journey continues. Today's journey is to visit the house we shall be moving into in two weeks time. It will take us through Tavistock and Merivale; past the prison at Princetown to the Two Bridges Hotel (sister to the Bedford Hotel) where we shall stop for coffee. We shall turn off the road to Ashburton and cross the Dart at Hexworthy before climbing up the hill which passes The Forest Inn and winds its way to Holne Moor. 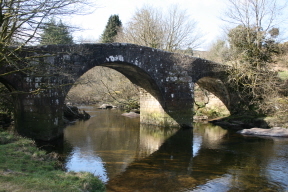 Here we will be in Forgotten Laughter country: dropping down to cross the O Brook at Saddle Bridge and up towards Combestone Tor and on to Venford. As always when we cross the moor, the landscape will be occupied by characters from previous books and sometimes, to my great surprise and delight, someone new: someone glimpsed who, as I turn towards them, fades leaving a promise that we shall meet again.